I found this recipe in the cake book "Helt i kage" by Camilla Plum, and as the rhubarbs in my little garden are doing their best to make a jungle, this recipe on rhubarb cake was the obvious choice for me to bake for my birthday coffee. Instead of star anise for the sugar sprinke, I decided to mix plain sugar with home-made chai sugar. Whip the butter and sugar into a foamy white mass on a stand-alone mixer. Add the eggs one by one, whipping in between. Add in the flour, ginger and baking powder. Afterwards stir in the rhubarb pieces. Add the cake dough into a round form (22-25 cm). Cover the surface of the cake dough with the mixture of sugar and chai sugar. Place the cake form in the middle of the oven, and bake the cake at 175'C for 1-1½ hour. The baking time is a little tricky to figure out due to the high water content coming from the rhubarb pieces. Cool down the cake, before it is remove from the form. 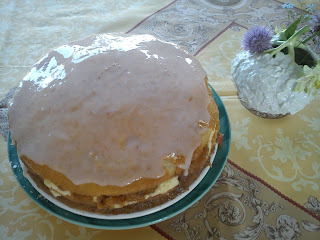 Enjoy the cake together with a cup of tea/coffee. This year I had not selected rhubarb as a specific theme as last year, but two of the four things served did contain rhubarb, as the rhubarbs in my garden is almost a jungle. 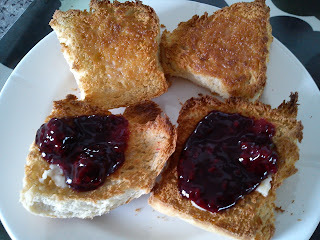 We started with the usual glass of sparkling wine to the talk running, before we sat down and enjoyed the saffron buns. These buns more or less equal birthday celebration for me, as the use of saffron in huge amount is a great way to celebrate life/birthdays. The first rhubarb cake was followed by the second cake in form of a rhubarb cream cake, where ½ l dairy whipping cream was mixed with 500 g rhubarb compote, this gives a fantastic taste. For those of my guests still having room in their stomach they could enjoy a sweet treat in form of strawberry-champagne marzipan in white chocolate. I will be sharing the various recipe from this birthday lunch in the very near future. Instead gin, sugar and lemon was used rhubarb gin and rhubard cordial. The sparkling wine was still sparkling wine ! Add the ice cubes into a champagne glass. Pour in the rhubarb gin and rhubarb cordial. I have been celebrating my upcoming birthday today with a lunch for the girl friends and my mother (could be referred to as the extended family). The lunch menu was Skagensrøre, patty shells with asparagus and scrimps and pie with bacon, mushrooms, spinach and Gryere cheese. Afterwards a cheese board followed by cream cake with rhubarb compote and white chocolate cream and strawberry-champagne marzipan sweet treat. I will be sharing the various recipe from this birthday lunch in the very near future. As a little sweet treat I have been making strawberry-champagne marzipan coated in white chocolate and sprinkled with freeze-dried raspberries as preparation for my up-coming birthday. The strawberry-champagne marzipan has been brought at Odense Marcipan as a special marzipan. So I did only have to cut the marzipan into smaller pieces, which were rolled into small bread shape follwed by coating in white chocolate. Cut the marzipan into smaller pieces, which is rolled into bread shape by hand. Temper the white chocolate to 29-31'C. Dip one piece of marzipan by the time into the melted white chocolate. Let the chocolate drip of, before the pieces in placed on a piece of baking paper, while it hardens. Store the marzipan sweet in an air-tight container, perhaps in the refrigerator. Today it is Store Bededag (Great Payer Day) (a Danish religious holiday celebrated on the 4th Friday after Easter). 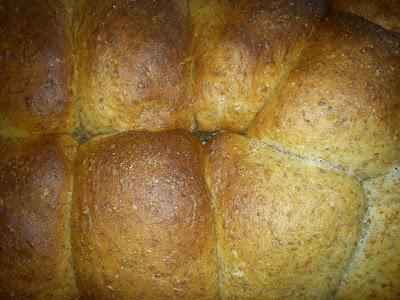 And it is the peak evening for enjoying roasted "hveder" - wheat buns with cardamon. I found this recipe on "hveder" at Isabellas, where I have exchanged the grahamflour with wholegrain wheatflour. I reduced the yeast amount, as I was adding some sour dough together with the yeast. The dough was to the liquid side after raising, so I am wondering, if the sour dough level was to much or should not have been added at all. The taste was good. Add the flours, salt, sugar and cardamone into the mixing bowl on a stand-alone mixer. Add in the butter pieces. Mix the butter pieces into the flour mix for 1-2 minutes. Stir the yeast into some part of the water. Afterwards add the rest of the water together with the sour dough. Add the liquid into the mixing bowl together with the egg. Knead the dough together at speed 3 for 5 minutes. Let the dough raise for 2-3 hours. 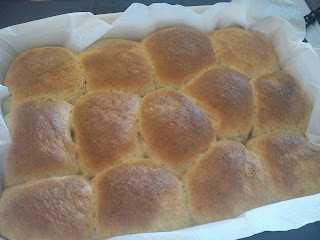 Bake the buns in the baking tray at 200'C for 20-30 minutes placed in the middle part of the oven. As inspiration for you I hereby share a selection of the various "hveder", which I have been baking over the years. 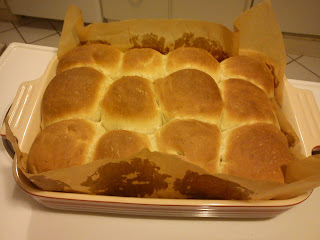 And tomorrow I will share the recipe of the "hveder", which I am baking this evening. Hveder med inspiration from "Maden imit liv"